Thirsk is a Mead Hall created by Hrothmund the Red and some fellow Skaal early in the third century of the Third Era (though some residents claim the founding dates back into the late Second Era). It is located south of Skaal Village in the Felsaad Coast region, on the banks of Lake Fjalding. The easiest way to reach it from Fort Frostmoth is to head east along the coast until you reach Iggnir River, then follow that to Lake Fjalding. By tradition, any who would seek to be chieftain of Thirsk must first perform a great task as a warrior and present a battle trophy to the Mead Hall. The record of Thirsk's chieftains covers roughly 102 years, beginning when Hrothmund the Red beheaded a challenger to the present time, when Bujold the Intrepid killed the beast of Ilfark. The record can be seen as a reflection of the hard life Solstheim offers: many chieftains managed to hold the position for merely a handful of years, and common causes of death included getting eaten by wolves, infected by rabies, and getting slain by the next chieftain. Much of Thirsk's past revolves around a vicious creature known as the Udyrfrykte. The Udyrfrykte had attacked and killed many residents when Thirsk was first founded, but had been sealed in its lair by a sorcerer named Eldrid Ice-Light, who used a wall of ice to trap it inside. A hundred years later, however, in 3E 427, this ice shield melted, and the Udyrfrykte escaped and killed many more people in Thirsk, including the Nerevarine's predecessor Skjoldr Wolf-Runner. A few years later, another chieftain would be killed by the Udyrfrykte Matron. Circa 4E 201, residents had become more enamored of mead than of battle, and they were driven out of the Mead Hall by a clan of Rieklings. Hrothmund the Red. Nord male. Slew Drengr Bronze-Helm and presented his head as a battle trophy. Ruled over Thirsk for twenty-one years. Slain and devoured by Ondjage, the Fell Wolf. Isgeror White-Wave. Nord female. Slew the necromancer Hildir Worm-Heart and presented his heart as a battle trophy. Ruled over Thirsk for four years. Einarr. Nord male. Slew the frost giant Guolog and presented his foot as a battle trophy. Ruled over Thirsk for six years. Gisl Round-Gut. Nord male. Slew Einarr and presented his sword as a battle trophy. Ruled over Thirsk for two months. Einarr the Younger. Nord male. Slew Gisl Round-Gut and presented his stomach as a battle trophy. Ruled over Thirsk for seven years. Grjotgaror. Nord male. Slew the white witch Katla and presented her staff as a battle trophy. Ruled over Thirsk for two years. Amelie Bontecou. Breton female. Slew Grjotgaror and presented his head as a battle trophy. Ruled over Thirsk for three years. Thorormr Storm-Killer. Nord male. Slew the brothers Ani and Ali and presented their enchanted hammers as battle trophies. Ruled over Thirsk for sixteen years. Aegilief. Nord Female. Slew Oddny the Unfaithful and presented her hand as a battle trophy. Ruled over Thirsk for eight years. Caccino Aurelia. Imperial male. Slew the Imperial hero Claudius Anzione and presented his sword as a battle trophy. Ruled over Thirsk for three weeks. Fraud. Eldjar Bear-Skinner. Nord male. Slew the Imperial fraud Caccino Aurelia and presented his tongue as a battle trophy. Ruled over Thirsk for five years. Falki the Fat. Nord male. Slew a pack of six rabid wolves and presented their claws as battle trophies. Ruled over Thirsk for three months. Succumbed to madness and death as a result of rabies. Svana the Knife. Nord female. Slew Gretta Wolf-Child and presented her sword as a battle trophy. Ruled over Thirsk for four years. Beinir White-Beard. Nord male. Slew three Orc raiders and presented their eyes as battle trophies. Ruled over Thirsk for twenty-two years. Skjoldr Wolf-Runner. Nord male. Slew the wizard Griss the Yellow and presented his head as a battle trophy. Ruled over Thirsk for three years. Slain in the mead hall by the Udyrfrykte. Though the Mead Hall's modern record does not record it, the Nerevarine slew the Udyrfrykte and presented his heart as a battle trophy, becoming chieftain. Unknown period of rule, but no more than a few years. Rumored to have disappeared on an expedition to Akavir. Agnar the Unwavering. Nord male. Became chieftain through marrying Svenja Snow-Song. Unknown period of rule. Killed by the Horror of Dive Rock, the Uderfrykte Matron. Several chieftains whose names were not recorded in the oral history of Thirsk. Girgun the Colossus. Nord male. Slew Thjold the Ill-Minded and presented his brains as a battle trophy. Ruled over Thirsk for six years. Vibeke the Stone. Nord female. Slew seven Imperial pirates and presented their helmets as battle trophies. Ruled over Thirsk for three years. Hjarknir Green-Hand. Nord male. Slew an entire grove of Spriggans and presented their taproot hearts as battle trophies. Ruled Thirsk for twenty-seven years. Bujold the Intrepid. Nord female. Slew the great beast of Ilfark and presented its stomach as a battle trophy. Unknown period of rule. 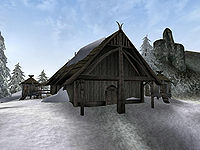 Player decisions in the Dragonborn expansion for TES V: Skyrim determine whether the Mead Hall is retaken by its former residents, and indeed whether Bujold regains her position as chieftain (albeit without the blessing of Hrothmund's spirit) or is driven out or even killed: or whether the Rieklings stay and the former residents are wiped out. For game-specific information, see the Bloodmoon article and the Dragonborn article. ^ Dialogue of Thirsk residents around 3E 427 claiming Thirsk is over 500 years old. ^ Dialogue of citizens of Cyrodiil during the Oblivion Crisis.